You may have seen my prior post entitled, “Republican? Democrat? Independent? The Partisan Affiliations of Everyone Running for Everything in Orange County.” In an effort to bring more information to voters, here is my humongous grid of endorsements, showing endorsements from the Democratic Party of Orange County, the Democratic Foundation of Orange County, the Orange County Register, the Republican Party of Orange County, the California Republican Assembly, the Lincoln Club of Orange County, Atlas PAC, and Family Action PAC. Regrettably, I’ve been unable to find a comprehensive, countywide listing of chamber and union endorsements. Also, some of these organizations endorsed in uncontested races. I excluded those from the grid. Note: The Orange County Register did not endorse in any school board races. Note: The Orange County Register did not endorse in any special district races. Note: Family Action PAC did not endorse any ballot measures. 7:19 PM – Two new alternates sworn in. 7:20 PM – Elected officials and candidates introduce themselves: Baron Night, Cathy Green, Charles Hart, Greg Sebourn, Mike Munzing, Eric Bever, Sam Allevato, Brian Chuchua, Jerry McCloskey, Robert Ming, Steven Choi, Karina Onofre, Brett Boxmiller, Roy Byrnes, Kim McCarthy, Don Wagner, Lynn Schott, Steve Nagel, Mark McCurdy, Fred Whitaker, Deborah Pauly, Denis Bilodeau, John Briscoe, Lucille Kring, Diane Harkey, Scott Voigts, Ed Royce, Travis Allen, and Larry Kramer. 7:23 PM – Congressman Ed Royce speaks of his race for re-election against Jay Chen and of Assemblyman Chris Norby’s race for re-election against Sharon Quirk-Silva and urges Republicans to assist Royce and Norby. Royce reports the America Shining Super PAC and Chen’s campaign have spent about $1,000,000 against him. Royce notes he’s given $1,000,000 to other Republican congressional candidates, and that’s one of the reasons he’s being targeted. 7:27 PM – Central Committee Member Desare Ferraro introduces the four new Youth Associate Board Members, who several female Central Committee members note are all female. They come from three public high schools and one private high school. 7:30 PM – First Vice Chairman John Warner, filling in for Chairman Scott Baugh, notes the 18 Republican headquarters throughout the county. He speaks of victory party on November 6 at 8 PM at the Costa Mesa Westin, sponsored by Tom Phillips of Eagle Publishing. 7:33 PM – Central Committee Treasurer Mark Bucher speaks of the Pepperdine poll that finds Prop 32 ahead. He speaks of the television ad campaign. 7:35 PM – Endorsements Committee Chair Mark Bucher gives a rundown of the last Endorsements Committee meeting. 7:38 PM – In response to a question, Bucher explains the weird situation in Irvine where if Steven Choi wins the mayor’s race, two council seats will be elected, but if Larry Agran wins the mayor’s race, then three council seats will be elected. Evan Chemers wants a third endorsement. 7:41 PM – Central Committee Member Steve Sarkis pulls San Juan Capistrano City Council. 7:42 PM – On Bucher’s motion and Sarkis’s second, the Central Committee votes unanimously to endorse Jerry McCloskey for Laguna Niguel City Council, Eric Bever for Mesa Consolidated Water District Division 1, Jeff Thomas for Municipal Water District of Orange County Division 6, and John Briscoe for Huntington Beach Union High School District Full-Term. 7:44 PM – On Central Committee Second Vice Chairman Mary Young’s motion, the Central Committee votes unanimously to make no endorsement for San Juan Capistrano City Council. 7:45 PM – There is a slight delay, as the By-Laws are consulted on the procedure to endorse Evan Chemers for Irvine City Council. 7:48 PM – It is a moot point, as no one actually motions for a Chemers endorsements. 7:49 PM – The Central Committee votes unanimously to endorse a “No” vote on Measure M, the Coast Community College District bond measure. 7:50 PM – Central Committee Member Jon Fleischman, publisher of the Flash Report, gives a presentation on all the statewide ballot propositions. 8:11 PM – Assemblywoman Diane Harkey speaks against Proposition 31 because it gives too many concessions to the left and that it gives the executive branch too much power over the Legislature. 8:13 PM – Central Committee Member Marcia Gilchrist says the CRP paid for the door hangers, so their endorsement stands. 8:14 PM – Central Committee Member Bill Dunlap says the Newport HQ is crossing out Yes on 31 and putting No on 31 instead. 8:16 PM – Assemblyman Don Wagner, an OC Political blogger, says the party should allow volunteers to write No on 31 if they oppose 31 out of respect for the volunteers. 8:17 PM – Central Committee Second Vice Chairman Mary Young says CRP paid for the hanger, and it is inappropriate to change the hangers without CRP’s consent. 8:18 PM – Bill Dunlap repeats his belief the hangers should be changed. 8:19 PM – Jon Fleischman echoes Gilchrists and Young’s comments. He also notes that you can’t change a door hanger that says, “The California Republican Party’s endorses…” to another position. 8:20 PM – The Central Committee moves on. 8:21 PM – Mary Young speaks of the importance of volunteering for Republican candidates and ballot measures. She notes Central Committee Secretary Zonya Townsend’s church registered 1,174 new Republicans. 8:23 PM – Zonya Townsend speaks of volunteerism and presents two OCGOP Volunteers of the Month. 8:42 PM – Central Committee Treasurer Mark Bucher says all the bills are paid. 8:43 PM – Diane McGlinchey speaks about the Romney campaign in OC. She thanks Marcia Gilchrist for subsidizing 1,000 Romney signs in OC. 8:46 PM – Mike Munzing promotes his fundraiser on Wednesday, October 17 from 5:30 PM-8:30 PM at Stadium Brewing. 8:48 PM – The Central Committee adjourns. The OC GOP Central Committee confirmed a set of early endorsements in August and regular endorsements in September. Here are those endorsements, so far. Tonight, the OC GOP Endorsements Committee meets to make recommendations to the OC GOP Central Committee for late endorsements to be made at the October 15 OC GOP Central Committee meeting. These late endorsements were either because the candidates submitted late applications or the decision was delayed by either the Central Committee or the Endorsements Committee (San Clemente’s Jim Dahl and San Juan Capistrano’s Sam Allevato and Ginny Kerr were delayed while the rest were late applications). 6:27 PM – The committee gains a quorum 27 minutes late. Thank you, traffic. 6:29 PM – Candidate Kim McCarthy says she’s 51 after briefly struggling to remember her age. She states that incumbent Sam Allevato voted for a $30 million bond that increased property taxes and has needlessly borrowed money to pay for city expenses that should have come from reserves. She worked at the Pontiac Motor Plant to work her way through Wayne State University. After Wayne State, she worked on commission basis. McCarthy says she wants respect for constituents’ money. She says she will not vote for bonds nor for any grants, matching or non-matching. She says she wants to help raise property values. 6:32 PM – Candidate Roy L. Byrnes is a physician by training has lived in Orange County since 1959 and was elected to the San Juan Capistrano City Council in 1972 and voluntarily retired in 1976 to spend more time teaching at UCI and on his medical practice. He expresses his concern about the leftward shift of City Councils in San Juan Capistrano, most recently led by Sam Allevato. Byrnes urges the committee to not “take the easy way out” by refusing to endorse. He says the city’s residents are 40% Democrats, and the Democrats do not bother to field a candidate because they’re happy with Allevato. (OC Political fact check: 26.6% of San Juan Capistrano’s registered voters are Democrats.) He says if the OC GOP fails to endorse, the Democrats will win. 6:35 PM – Central Committee Member Norm Dickinson says McCarthy supported and contributed to Democrat Laura Freeze. 6:39 PM – San Juan Capistrano Planning Commissioner Rob Williams speaks in opposition to Kim McCarthy because he says she only says negative things about the city even when he says the facts contradict her. He says McCarthy not only contributed money but also walked precincts for Democrat Laura Freeze, who unseated Joe Soto, the CRA/OCGOP-endorsed candidate. 6:41 PM – A resident speaks of the high water rates in San Juan Capistrano. He says there’s a $100 million debt, including a water department with a now-$6 million debt (previously $8 million). He says he voted for Democrat Freeze because her supporters hoodwinked him into thinking she was a fiscal conservative and that Freeze fooled many others. 6:43 PM – McCarthy states she gave two $250 checks to Freeze, who had told her she was a fiscal conservative with a financial background. McCarthy notes she’s endorsed by SOCRA and Family Action PAC, as is Byrnes. She says she would never support or vote for Freeze again. 6:45 PM – Byrnes says he and McCarthy are not politicians, just Republicans trying to do the best they can. He says that “evil triumphs” when the good do nothing, and that’s the reason the OC GOP should endorse in this race to prevent the Democrats from capturing one of the Council seats. 6:47 PM – Endorsements Committee Member Mary Young expresses her concern about candidates who simply attack their opponents but do not explain what they will do as Councilmembers. Young expresses her concern that McCarthy failed to disclose her support for Freeze on the endorsements questionnaire in the section that asked about support of Democrats. McCarthy accused Young of making her mind up before the meeting. Endorsements Committee Chair Mark Bucher cuts off both McCarthy and Young. 6:48 PM – Endorsements Committee Member Thomas Gordon asks how Planning Commissioner Williams had voted on the religious school taxation issue. After dodging the question for a while, Williams says he voted for the tax. 6:49 PM – Endorsements Committee Member Mary Young speaks and Candidate Kim McCarthy starts shouting over her, with each demanding that the other show respect. Young states and McCarthy shouts about how hard they work on the Central Committee and as a candidate, respectively. (OC Political wishes we had a camera going.) McCarthy rises out of her seat as the male Endorsements Committee members have facial expressions of concern about a potential physical confrontation. 6:50 PM – Endorsements Committee Member Mary Young makes a motion to endorse nobody. It dies for lack of a second. 6:51 PM – Endorsements Committee Member Thomas Gordon expresses his disappointment in the fighting. He says he received numerous phone calls from legislators and other elected officials, and that he is insulted that Allevato couldn’t show up for the meeting when he requested the endorsement while Gordon drove 60 miles from his office to be here. 6:53 PM – Endorsements Committee Member Chandra Chell says a first-time candidate does not have a voting record, so we can only take a candidate at their word. 6:54 PM – Discussion ensues as the committee notes several people who gave money to Democrats were endorsed by the OC GOP Central Committee. 6:55 PM – Endorsements Committee Chair Mark Bucher expresses his disappointment at the way McCarthy conducted herself toward Endorsements Committee Member Mary Young. However, Bucher says he is completely unimpressed with McCarthy’s opponents who were absent despite saying they would be present. Bucher also expresses his concern about the need for elected officials to show restraint. Bucher expresses concern about Allevato’s support of the impact fee imposed on religious schools, which Bucher says is simply a tax by another name. 6:56 PM – Endorsements Committee Member Thomas Gordon echoes Bucher’s disappointment about McCarthy’s treatment of Young, but he still plans to vote to recommend McCarthy for endorsement and hopes she wins the election. He says if she gets the endorsement, she represents the Republican Party, and she hopes to represent the people of San Juan Capistrano. If she reacts like that to Young, she may do the same to constituents, which will reflect badly upon both the Republican Party and the City of San Juan Capistrano. 6:58 PM – The vote is 2-1-1 (Gordon and Chell in favor, Young against, and Bucher abstaining) to recommend the endorsements of McCarthy and Byrnes. I don’t know what they said, but McCarthy and Young spoke and shook hands after the vote. 7:02 PM – Endorsements Committee Member Mary Young asks about how many people are running for how many seats. 7:02 PM – Dahl says there are two slots with five candidates. 7:03 PM – Central Committee Alternate Jennifer Beall notes Dahl endorsed John Alpay in the 2010 Capistrano Unified School District recall and again in this 2012 general election. Beall notes Alpay is an official endorsement against Prop 32. She says Dahl has “spit in the face” of the party for twice backing Alpay against OC GOP-endorsed candidates. 7:05 PM – Central Committee Member Norm Dickinson speaks in favor of Dahl, citing his property rights record as the only council member backing the CA GOP position on a San Clemente ballot measure. 7:06 PM – Dahl says he considers Alpay a friend and considers it a matter of honor and will not withdraw his endorsement of Alpay. 7:07 PM – Endorsements Committee Member Chandra Chell asks how can Dahl reconcile being a fiscal conservative with endorsing Alpay (the only candidate running for his trustee area in the 2010 CUSD recall). 7:08 PM – Endorsements Committee Chair Mark Bucher says the target of the 2010 CUSD recall was the OC GOP-endorsed candidate. 7:09 PM – Endorsements Committee Member Mary Young speaks of Beall being the top Republican activist in the CUSD. 7:10 PM – Endorsements Committee Member Thomas Gordon expresses concern about Dahl endorsing Alpay against the OC GOP-endorsed candidate in both 2012 and 2010 (and implicitly for the 2010 recall). 7:11 PM – Endorsements Committee Chair Mark Bucher says a 2012 endorsement of Alpay might be forgivable, but a 2010 endorsement is not. 7:11 PM – No one makes any motion regarding Dahl, so the Committee moves on. 7:12 PM – Endorsements Committee Member Chandra Chell speaks in favor of Eric Bever based on his record as a Costa Mesa Councilman and his role as part of Righeimer’s team. The committee votes unanimously to recommend Bever for endorsement. 7:13 PM – Incumbent Jeffrey Thomas praises the work of the Endorsements Committee and of OC GOP Executive Director Scott Loenhorst. He says they should never be yelled at. Thomas was appointed to the seat three years ago when his predecessor had been flown to a board meeting on a Metropolitan Water District of Southern California plane from his La Quinta home (far outside MWDOC). Thomas was appointed to replace the carpetbagger. Thomas won a two-year term in 2010 and is up for re-election this year. He fought the state’s $13 billion water bond and will fight the 2013 water bond that will likely be $14 billion. 7:15 PM – The Endorsements Committee votes unanimously to recommend Thomas for endorsement. Thomas pledges not to stay an argue. 7:16 PM – Candidate John Briscoe speaks against a $250 million bond in the Ocean View School District, a $27 million technology bond in Fountain Valley School District, and a $927 million bond in the Coast Community College District that doesn’t build any schools. He says the incumbents are “tiny-R” Republicans who brag about their endorsements by the unions, and the unions will spend $100,000 to buy those two seats. 7:19 PM – Endorsements Committee Member Thomas Gordon asks if Briscoe is endorsed by Huntington Beach City Councilman (and former Huntington Beach Union High School District Board Member) Matt Harper. 7:20 PM – Briscoe says Harper would have endorsed him had he run for the short-term two-year seat instead of one of the two full-term four-year seats. He says he is endorsed by Congressman Dana Rohrabacher, Assemblyman Jim Silva, and former Assemblymen Van Tran and Chuck DeVore. 7:20 PM – The Endorsements Committee votes unanimously to recommend Briscoe for endorsement. 7:20 PM – In response to an inquiry from Central Committee Alternate Scott Peotter, Endorsements Committee Chair Mark Bucher notes that because Christina Shea and Lynn Schott are already endorsed for the two Council seats in Irvine, so the Endorsements Committee has no ability to take action on Evan Chemers. Bucher says there is also inadequate notice. He says a Chemers endorsement can be considered by the whole Central Committee who can endorse more candidates than spots and who would have adequate notice. 7:22 PM – The Endorsements Committee adjourns. These late endorsements were either because the candidates submitted late applications or the decision was delayed by either the Central Committee or the Endorsements Committee (Allevato, Kerr, and Dahl were delayed while the rest were late applications). 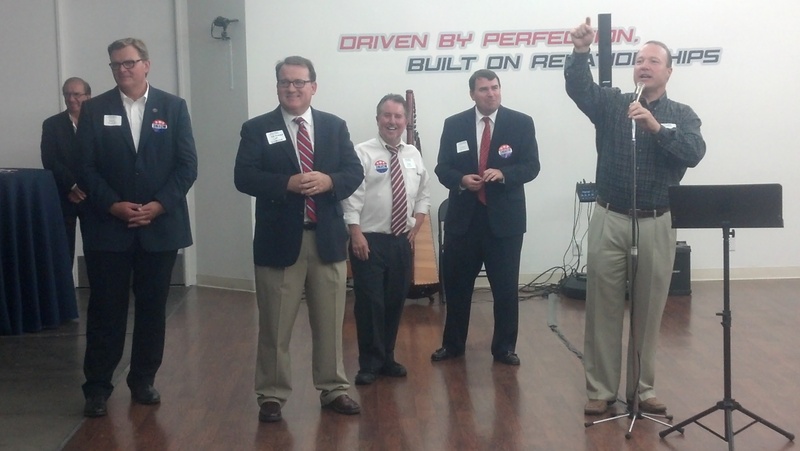 Last night, the “3Ms” as they’re called, current council members Steve Mensinger and Gary Monahan, and council candidate Colin McCarthy, made their pitch for the upcoming November Costa Mesa City Council election at a fundraiser put on by Jeff Mathews (candidate for Costa Mesa Sanitary District) at Eurocar, a high-end car dealership in Costa Mesa. All three candidates made the argument that the city is at a crossroads regarding unsustainable city spending, and they pledged to make sure that city services and funds will exist not only for current residents, but for their children, as well. Jim Righeimer emphasized the need to pass Measure V which would make Costa Mesa a charter city, and give it more flexibility in negotiating with city workers and allow it to outsource some city services, resulting in significant savings to the city and the residents. The event rasied thousands of dollars for the candidates and Measure V, and was well-attended. Those in attendance included California Assembly members Tim Donnelly, Diane Harkey, Allan Mansoor, and Don Wagner. Local candidates Jim Fisler (Mesa Water District incumbent running for re-election) and Don Harper (running for Costa Mesa Sanitary District) also were in attendance. In addition, Irvine council member Jeff Lalloway, long-time party supporters Buck Johns and Judy Ware, as well as several party supporters attended.